Learn in our online distilling alcohol courses and distilling alcohol workshops the distillation of outstanding spirits and fruit brandies – learn how to distill easily top-quality alcohol at home (short instructions). 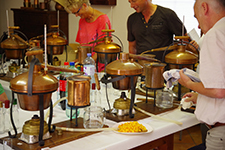 The hands-on course covers correct harvest, how to make the mash, distillation of alcohol, construction and design of an alcohol still, plenty of recipes for mashes, infusions, and spirits as well as bottling your distilled alcohol. In these practical distilling classes you learn all steps on the basis of pictures, videos, descriptions, and charts. Watch our point-of-view videos to see every single processing step in detail. You study the online distilling alcohol seminar at your own speed, completed by a test and a certificate. The online distilling alcohol classes can be followed from anywhere at any time. You learn all topics concerning distilling alcohol at home: How to prepare the fruit? Which type of drums / barrels are usable? How to prepare the mash? Which problems can occur and how to prevent them? How can you construct an alcohol still? How to perform an alcohol distillation in detail? How to dilute and store the spirits. You will find also a comprehensive collection of recipes for mashes, infusions, and spirits. In the distilling alcohol workshop you learn in one and a half days all secrets of home distilling. On the first day of the distilling alcohol course you learn all about the theory of making alcohol at home. The hands-on training is carried out on the whole second day: in the distilling alcohol workshop you distill independently alcohol by yourself with a provided copper pot still. Afterwards you measure the alcohol content of your own distilled spirits and dilute the moonshiners. The workshop takes place in Klagenfurt, Carinthia (Austria). In the distilling alcohol workshop you perform all steps by your own – from the distillation to diluting and bottling the spirits. The distilling courses are suitable for beginners as well as for advanced distillers.